A complete guide to building and preparing a stock car for dirt track competition. 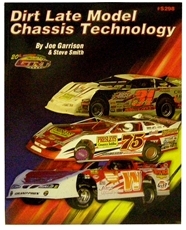 Includes: Race car construction, mounts/brackets/interior, wiring and plumbing, race car body, painting, front suspension, and steering, rear suspensions, shocks, braking systems, tires and wheels, the engine, transmission and driveline, chassis set-up and alignment, track tuning, Maintenance and record keeping, repairing a crashed car. Important tips and details from an expert.